[S871] FamilySearch, at https://familysearch.org/, Film 1040116, 0102727, Batch C11355-1. [S612] GRO Scotland, birth/bapt record, Parish of Fortingall, OPR Births/baptisms, GRO 355/0A 0030 0036. [S117] Census - 6 Jun 1841, UK census, Scottish GRO 355/0A 010/00 001. [S118] Census - 30 Mar 1851, UK census, Scottish GRO 355/0A 010/00 003. [S340] Census - 7 Apr 1861, UK census, Scottish GRO 367/00 004/00 007 & 008. 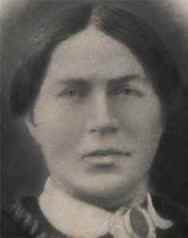 She married Alexander FERGUSSON, son of John FERGUSSON and Christy McGREGOR, in Rannoch, Fortingall, Perthshire, on 7 February 1854. [S871] FamilySearch, at https://familysearch.org/, Film 1040116, 0102727, Batch C11355-2. [S612] GRO Scotland, birth/bapt record, Parish of Fortingall, OPR Births/baptisms, GRO 355/0A 0030 0041. [S340] Census - 7 Apr 1861, UK census, Scottish GRO 501/00 001/00 008. [S367] Census - 2 Apr 1871, UK census, Scottish GRO 644/02 093/00 019. [S918] GRO Scotland, death record, District of Dennistoun, Statutory Deaths, GRO 644/03 0881, aged 44. [S612] GRO Scotland, birth/bapt record, Parish of Barony, OPR Births/baptisms, GRO 622/00 0027 FR4058. [S612] GRO Scotland, birth/bapt record, District of Old or West Kilpatrick, Statutory Births, GRO 501/00 0181. [S612] GRO Scotland, birth/bapt record, District of Old Kilpatrick, Statutory Births, GRO 501/00 0179. [S612] GRO Scotland, birth/bapt record, District of Old or West Kilpatrick, Statutory Births, GRO 501/00 0168. [S612] GRO Scotland, birth/bapt record, District of Old or West Kilpatrick, Statutory Births, GRO 501/00 0135. [S612] GRO Scotland, birth/bapt record, District of Old or West Kilpatrick, Statutory Births, GRO 501/00 0152. [S612] GRO Scotland, birth/bapt record, District of Old or West Kilpatrick, Statutory Births, GRO 501/00 0177. [S612] GRO Scotland, birth/bapt record, District of High Church, Statutory Births, GRO 644/02 0744. [S189] International Genealogical Index (IGI), Entry 7509319/25, Perth. [S612] GRO Scotland, birth/bapt record, Parish of Fortingall, OPR Births/baptisms, GRO 355/0A 0030 0049. [S488] Index - Queensland BDMs (online and fiche), at https://www.qld.gov.au/law/…, Birth Reg. No. 1910/C6133. [S396] Ryerson Index to Australian Newspaper Death and Obituary Notices, at http://www.rootsweb.com/~nswsdps/dpsindex.htm, Brisbane Courier Mail of 1 Nov 2000 (claimed - which means they published before she died - hence this date suspect). [S489] Brisbane City Council Cemeteries database, at https://graves.brisbane.qld.gov.au/, Portion MPL, Section DOUB, grave 172. [S331] Government Publication - Lawrence School Register. [S331] Government Publication - Lawrence School Register, commenced school aged 7, attained Std 4 in Sep 1880 (aged 12) and Std 6 in Oct 1882 (aged 14). It is unclear why she remained in Std 6 from 1882 to 1884 unless illness was the reason. 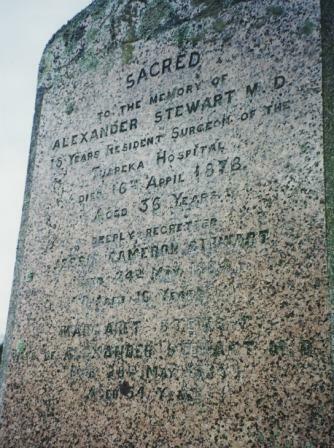 [S126] Cemetery Marker - Alexander Stewart / Margaret Robertson / Jessie Stewart, Lawrence cemetery, NZ. [S542] Index - New Zealand BDMs online, at http://www.bdmhistoricalrecords.dia.govt.nz/, Death Reg. No. 1884/1822, aged 16. [S35] Cemetery Entry - unknown author, Lawrence Cemetery register, Block 1, Plot 52-53. John STEWART was born in Fortingall, Perthshire, circa 1793. He was widowed on the death of his wife Janet before 1851. [S917] GRO Scotland, marriage record, Parish of Fortingall, OPR Marriages, GRO 355/0A 0030 0124. [S189] International Genealogical Index (IGI), Entry 7509319/24, Perth. [S612] GRO Scotland, birth/bapt record, Parish of Fortingall, OPR Births/baptisms, GRO 355/0A 0030 0051 FR695A3. [S871] FamilySearch, at https://familysearch.org/, FHL film 1040116, 0102727. [S340] Census - 7 Apr 1861, UK census, Scottish GRO 355/0A 010/00 008. [S468] Family Tree - Daniel A Cooper, "Family Trees - McGregors by Cooper" , See Note 49. [S917] GRO Scotland, marriage record, Parish of Dull, OPR Marriages, GRO 346/00 0060 0180 and Parish of Fortingall, OPR Marriages, GRO 355/0A 0030 147, FR783. [S918] GRO Scotland, death record, District of Gairloch, Statutory Deaths, GRO 066/01 0008, aged 64. [S542] Index - New Zealand BDMs online, at http://www.bdmhistoricalrecords.dia.govt.nz/, Birth Reg. No. 1870/9273. [S331] Government Publication - Lawrence School Register, attained Std 1 in Sep 1880 (aged 10), Std 4 in Oct 1882, Std 5 in Sep 1883 and Std 6 in Aug 1884 (aged 12). [S341] Book - Stone's, Stone's Street Directories, as cited by Noel Read. [S332] Will - Margaret Robertson, Archives of New Zealand, Dunedin Regional Office DAAC/9078/876 L27/99. [S542] Index - New Zealand BDMs online, at http://www.bdmhistoricalrecords.dia.govt.nz/, Death Reg. No. 1941/29647, aged 71 is the best fit to his age. [S189] International Genealogical Index (IGI), Entry 7509319/23, Perth. [S612] GRO Scotland, birth/bapt record, Parish of Fortingall, OPR Births/baptisms, GRO 355/0A 0030 0054 FR697A3.